Watford High Street near the corner of Queens Road. I was searching for anything to do with the “Importers” shop in lower High Street and up popped this site. What a treasure! I was born in ’58 at Stanborough Park and lived in Bushey and Watford until 1996. Although it took a ride on the 301 to get into town it seemed closer than Bushey high street as that was walking only. As soon as I was old enough to ride the bus alone, Watford was the place to go. As a child, shopping in the town was a Saturday affair and was as regular and guaranteed as going to church the following morning. “One and two halves to high street station” was the invocation –forever in my mind’s ear- that bore us to a fascinating sprawl of shops and stalls providing everything for everyone. The exhaust from the coffee shop was at head height to a little ‘un and issued from the vent at quite a rate. I used to take a deep breath as we approached and brace myself for the hot blast to come whilst mum would comment on how pleasant the aroma was. Mac fisheries, opposite the co-op. Two shop fronts; one for fish and I think the other was the delicatessen. Brightly lit but always cold and damp, black and white ceramic tiles everywhere and a fascinating knockout between the two premises that continued the tiling through from one side to the fishy side where the odours were just too much for a little pair of nostrils. Fantos had a mention somewhere. Needless to say, the only section that existed for me was the toy department. Restrained within an alcove for eleven months of the year, it burst out on to the entire width of the front end of the first floor during December in a time when Christmas didn’t start until the twelfth month. Cawdell’s: I remember the Santa ride with great fondness. Jeremy, the term “groddled about” to describe its motion is absolutely brilliant, although at the time it was far too magical an experience for such harsh terms! It certainly transported me. I guess it must have been constructed by the shop’s handymen –when such labour existed. Watford junction, twelve platforms, was it? Hissing of the hydraulic lifts; mysterious things to a young ‘un. The Bridle Path, many memories there. At the top end there was a semi detached house, the right hand one was a cafe for as long as I had known it. The left hand one, from C1972 until C1985 was my dad’s plastic moulding factory! Many hours spent watching the trains from the upstairs bay window. All gone now. Remember the Orange Hand shop at the high street end of Queens Road in the early seventies? A kind of post-hippie cool clothing store. I picked up some really wacky stuff there. Flares and 4” platforms; what was I thinking?? Timothy Whites (I said in no particular order) was the first shop in town to have an escalator. My favourite escalator was the one in Clement’s. If I’d been good, I was allowed to travel up it three times during Saturday shopping, returning via the back stairs. Three times was the limit I was told, lest my activity attract the attention of the comissionaire, an upright, pinstriped-suited gentleman with swept-back grey hair and a prominent moustach, who as far as I could tell was never seen without a white carnation in his lapel. 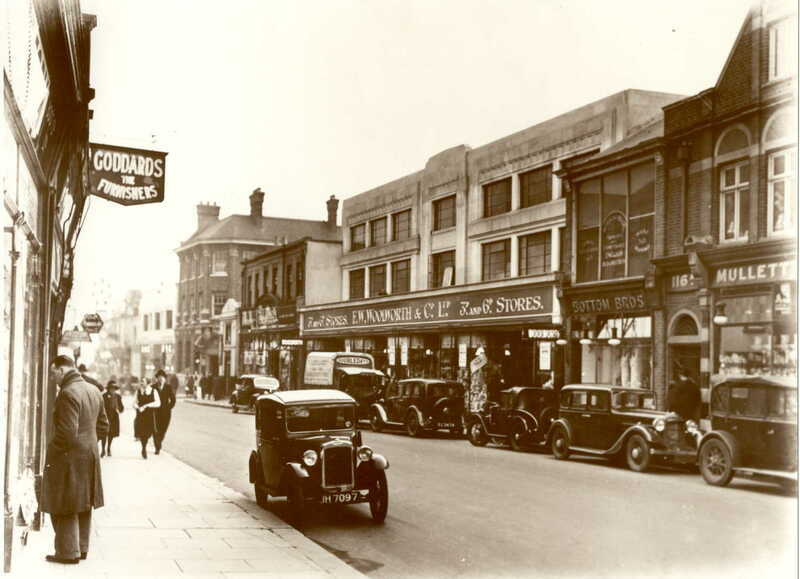 There was a quaint shop on Queens Road, more or less opposite the Radlett Road junction, called Avondales. A tiny but somehow vastly stocked emporium of electrical junk. Perfect for a pocket-money based self education into all things electrical. Mickey Mouse’s Bungalow, anyone? Demolished in C1973, it was a low, concrete shelter-like building next to the library, behind where the bandstand is now sited. It was a sub station from a time when Watford had its own electricity supply (Cardiff Road power station) for street lighting and municipal buildings. My friend’s mum worked at Clement’s and passed there on her way home for lunch. Knowing our passion for electrical junk, she enquired about the equipment being discarded and subsequently ferried loads of it on her shopping trolley (I have no idea how) to their house on Hempstead Road for us to play with. Some really antique –and huge- stuff! Carey Place, now a strange pastiche of its former self. When I first saw the blocked up version I wanted to close my eyes and keep on walking through the wall at the end. Where the old covered market started, outside the side entrance to Cawdell’s, and again at the back end of the arcade by the cafe on the corner (cheese sandwiches and orange juice; yum), there were two beautiful semi-circular mosaics set into the vaulted ceiling, with the words “Market Arcade” set out around the radius. Sometime in the eighties I was taking photographs from the top of Charter Place car park and happened to look down into a walled-off dead space at the rear of the spiral ramp. Although barely visible through the wooden slats that bound them (someone must have received an order to set them aside) there were the two mosaics, still mounted on a foot or more of semi-circular masonry; one propped against the wall, the other fallen onto its face. By that time they were in a poor way. I made many calls to the town hall and museum in an attempt to have them rescued but as far as I know they never saw the light of day again. So sad. Dad worked at the Town Hall in the early sixties. He and his mates mounted the coat of arms that adorns the balustrade. Idyllic childhood vignette: Early Saturday morning, a little boy in shorts riding high atop a bouncing pile of deckchairs as dad pulls them along on a four wheeled handcart from the town hall stores, along Rickmansworth Road, through the archway and down to the bandstand to set them out for the afternoon’s performance. Yes, so many things have gone, but never the memories and mysteries that accompany a child growing up with access to such a place. This page was added on 30/10/2011. May I add a few items? Beside the covered market, about opposite the side door into Cawdell’s there was a farrier; on a hot summer day, the smell of a horse hoof when the hot shoe was applied was fairly trapped in the confined space, and was not appreciated. Macfisheries had a nasty little trick; at the end of the day they cleared the open slabs and then hosed them down onto the ground and across the footpath; another unappreciated smell, unlike the coffee-bean roaster. Into the 1930s Woolworths really was a 3d and 6d Store. A kettle might be 6d and the lid 3d. The shop had island counters with the serving girl inside surround by four counters set out in open box form. Each box of appropriate size would contain, for example screws, nails, hinges, and you would select how many you wanted, or perhaps a weight amount, they would go into a little bag, and you would pay the girl who had a cash register in the island. All very simple and civilised. Watford Junction did indeed have 12 platforms; there were two numbering systems. In one, the four platforms in the newer all-electric section were 1, 1 Bay, 2 Bay, 2. On the main-line section were 3 Bay (electric), 3, 4, 5, 6. There was then a gap at the north end where the locomotive shed’s tracks were “inserted”, then came 7 Bay for St Alban’s branch trains, then 7 and 8 which were basically for longer trains to London starting or finishing at Watford. The other (later?) numbering system was a simple 1 to 12. The paved bridle path, leading up from the station forecourt to St Alban’s Road, came up a slope and levelled out right beside Platform 3 Bay (or 5), and was a prime spot for spotters. I was there one day when some stupid youth acquired a length of barbed wire and threw it over the fence and across the electric track. There was a blinding flash, and most of the spotters scarpered. Since I was not involved, I stayed put. Shortly after a policeman appeared and had a look at the wire, but he said nothing, so neither did I. Further north along the Bridle path was a secondary entrance to platforms 3 Bay and 3, with a footbridge to 4, 5 and 6, but I never saw it open. Almost opposite was a little second-hand shop, known as “Joe’s Junk Shop” from which one (with sufficient pocket money) could acquire additional parts for one’s Hornby railway. The said “Joe” was a bit casual (scruffy, shirt without a collar) and not very friendly, but he had the goods. Watford Town Hall. During the war at some point, “Lord Haw Haw” (William Joyce, the traitor) told Britain on his propaganda radio that the clock was a couple of minutes slow; so we understood that somewhere there was a spy watching us. The Town Hall had a large public hall in which, about 1946 I think, there was a Watford exhibition, including stands from all the industrial firms in and around the town; the place was humming with productive activity, like so many of the towns and cities of pre- and post-war Britain. Several printers and magazine publishers (Sun Engraving, Greycaines, and …? ), Scammell lorries and “mechanical horses” used by the railways, electrical manufacture, Ovaltine at Kings Langley, Wren’s shoe polish, Ellam’s duplicators, Cox tubular steel furniture (on the Watford By-pass), Benskin’s Brewery (with the loudest air-raid siren in town), breakfast cereals at Stanborough Park (I think), and doubtless a few more (all from memory). How are the mighty fallen! Watford was a good town in which to grow up. Great to read all these tales about Watford. I used to have a Friday night / Saturday job in MacFisheries right in the middle of town. That would heave been around 1972, my pay for Friday and all day Saturday was £1.60 ! So many shops have now gone, Hammond’s music shop in Queens Road was marvellous, all those guitars and drums. Colin Lester mans shop for Levis sat-press trousers and Oxford shoes with blakeys fitted for a good ‘click’. I recall driving with my parents to trewins, there was a small car park, no more than 50 spaces, you could always get a place to park, imagine that today! Keep the stories coming.